Yesterday I had the privilege and joy of helping to officiate the wedding ceremony of a former student and her bridegroom. This was the most unique ceremony I have ever participated in because it was held in a Catholic Church and primarily led by the priest. I read the Gospel reading and gave a short five-minute homily/blessing. How ironic that a Protestant, Reformed pastor got to preach a five-minute blessing in a Catholic Church! If that wasn’t a picture of unity and ecumenism, I don’t know what is. Several reflections come to mind from this experience. 1. Architecture can convey the sacred. There was something about the beauty of this church that was so sacred. I remarked to several guests how evangelical, non-denominational churches have lost something in their architecture. Our contemporary, office-like architecture seems to have forgotten something about how important the space is. I’m beginning to see why God was so meticulous with the building plans of the Tabernacle or the Temple even. I imagine that the craftsmanship that went into building these sacred spaces inspired the worship as much as it reminded the people whom they were worshiping. When you walked into this sanctuary (even the word is quite appropriate), you knew you were in the presence of the divine and the sacred. The high cathedral ceilings, the natural light, even the arrangement of the altar were so inspiring. One would assume that such a sacred space would be archaic, even gothic feeling. However, it was a very beautiful blend of modernity and the sacred. 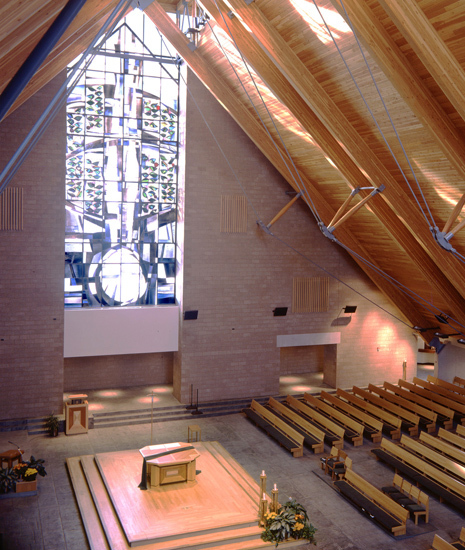 I thought to myself that if only we could blend the “come as you are” architecture of most non-denominational churches with the majestic, sacred space of many “high church” buildings – that would be a unique space. At the same time, I am awestruck that the Bible calls us the new temple of God. As beautiful and inspiring as that building was, the power lies in the people of God gathering together under Jesus Christ as our head. The new temple far outshines and outlasts the physical one, yet there is something important about being reminded of God’s presence beyond just the audible. The visual space does make a difference. 2. Religiosity is detestable to the Lord. As I was admiring the beauty of the physical building, I couldn’t help but notice a lot of the rituals inherent with the building itself. Although I went to Catholic school for two years, I forgot how many liturgical actions were part of attending a service or a wedding for that matter. Whenever a person passed the altar, he/she had to bow in respect to the altar or priest. There were several set responses to prayers and liturgies that all of the Catholic guests knew. However, I found it ironic that as soon as some of the folks (mostly the young adults/college-aged) left the building, their language and actions were indistinguishable from those who are unchurched. At the risk of judging these folks, it was pretty obvious that most of them did a good job of compartmentalizing their acts of worship/sacrifice in the church from the rest of their lives. They knew all of the responses and the right behavior in the church service, but outside of it, they were the lord of their own empires. Their ethics, values, and thought processes did not appear to be informed by the will of the God they had just come before. It reminded me so much of the empty worship, the religiosity, of pre-exilic Israel. They knew all the rites, sacrifices, and liturgies, yet God indicts them for having their hearts far from them. What an abomination such worship must have been – going through the motions, knowing all the right things to say, but keeping it confined to the walls of a building or a space. God wants all of our lives, not just the right liturgical responses. More than condemning these folks, it was a stark reminder to me to worship in spirit and in truth, and to call my people to do the same. 3. That said, there is still a great deal of beauty to be found in the Catholic rites and liturgies. Some of the prayers, Scripture readings, and songs were so beautiful. The liturgy inspired me to worship the majesty and splendor of Christ. The prayers reminded me of my need for divine grace every hour. The exhortations of the priest made me want to come closer to God. I can understand now the recent resurgence in the use of liturgy and ancient practices even in churches that are not historically rooted that way. There’s something so powerful to these liturgies passed down. I want to spend some concentrated time getting in touch with the rich treasures these practices could be for our faith. I don’t mean to make an analysis out of what was a beautiful wedding. It was my first time participating in a Catholic wedding, and I am so grateful for the charity and hospitality of Father Rich in leading me through the ceremony. More than that, I am overjoyed at the beautiful display of sanctity and joy as two friends obeyed God’s plan for marriage. This covenant before God is indeed a beautiful and powerful mystery. The fact that it took place in a community of witnesses and in such a beautiful and sacred building only added to its significance. I’m pleased you were able to officiate and find sacred beauty in a marriage performed in a Catholic church. There needs to be a closer relationship among Catholic & Protestant denominations. We are all Children of God seeking His blessings and hoping to honor Him. As for the behavior outside of the church. I’d venture to say one may find the same true in other churches. Perhaps some more than others. I attended Catholic school K-8. It was over 40yrs ago & there have been changes. The bowing or genuflecting at the alter has to do with the presence of the consecrated hosts in the tabernacle, the presence of Jesus. It is not so much a bowing to a priest. For better or worse, I find the big difference comes with ritual and formality. Prayer seems more natural, spontaneous, and even heart-felt now. As a Catholic school girl who went through all the sacraments, I knew the prayers and the ritual; some even in Latin. It was taught so even children could follow without in depth study. We learned the Biblical stories, but seldom read the Bible. We recited and believed the Apostles Creed, catholic church spelled with a capital “C”. Peter was our first Pope. When the economy was good, we built churches with stained glass windows and aesthetically beautiful architecture. When the Pope said things were tight, the stained glass windows were the first to disappear in the new church. It was practical. I can’t say that I’ve held to all that I learned in the Catholic church, but it does still hold an honored place in my life. I remember my First Holy Communion. “My shepherd is the Lord. Nothing indeed shall I want.” A Christian belief, no matter what the denomination. That’s true about hypocrisy being in any church. I think that it was more pronounced because of the juxtaposition of participating in the liturgy just minutes prior. As for the differences in ritual and formality, I find that although prayer can seem more natural because its extemporaneous expression in an evangelical church, sometimes it leads to imprecision and flat-out heresy in the way we pray. There is something beautiful and orthodox about liturgical prayer. Just my two cents..I love both. I have worshiped at my son’s evangelical church for 10 years while also worshiping at my Catholic Church. Yes, I often attend two church services on Sunday. I love the “styles” of each church but feel closer to God when I worship in my Catholic Church. I can tell you both have truly devout people who are developing a wonderful relationship with our Lord Jesus & are on a path to salvation. Both also have those who come to be entertained (in the evangelical church) and do their duty (in the Catholic) never thinking of the true purpose of worship. Worship, be it liturgical or non liturgical, is to give reverence and adoration to our creator. One’s “heart” has to be in the service in order to have full benefit for the attender and to honor our Lord. I think it is wonderful that there are many types of worship environments in which to do this. It is good you were able to participate in the marriage of this couple in a Catholic Church. Perhaps if we respect and go to others worship services with an open heart we can learn from each other. Ask questions, read from reliable resources, and do not judge what you do not understand. There will always be theological differences because that is what human is being about – our differences. With the help of the Holy Spirit and our trust in His abilities we may one day build a bridge between the Protestant and Catholic world. One which we can cross easily as we travel this life in search of the one true God. My daily prayer is that one day all Christian Churches will be unified. How this is to be I do not know. I will put my trust that God has the means to make this happen. God Bless. A point for clarity – there really is no such thing as a non-liturgical worship service. Every tradition has its ‘liturgy’ – set way of conducting the worship of God. Thanks again for sharing! You are right Rev Lee. I should have said different liturgies. Thanks for the correction.